So you’ve started a blog! Being a blogger is tons of fun! Whether you’re writing about your life in general or a specific niche, me thinks we can all agree there has to be a passion for the craft or we’d all go cra-crazy quickly. As I sit here typing away I can easily remember how jazzed up I was in the early days of blogging, what power there is in sharing my thoughts and dreams here in my little spot on the web. Eventually my blog developed and I found that my inbox was becoming jammed with opportunities to review products but unfortunately not the products I would have chosen. Somehow I don’t feel the need for a moustache trimmer..but that’s just me. I decided to take the proverbial bull by the horns and pitch brands I’d really like to work with. Having the idea to pitch brands is good and all but it’s worthless if you don’t know how. There is an art to it which is unique to each and every blogger but perhaps I can help shed some light into pitching for the newer bloggers out there with my Pitching A Brand series. 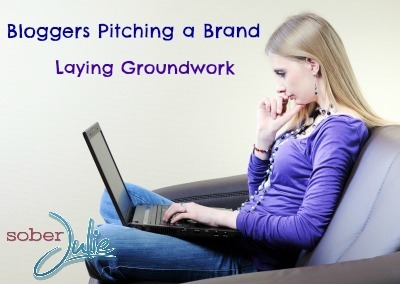 This is the first of the series, which will help you with the groundwork bloggers do before the actual pitch is sent. Before you begin seeking out opportunities with brands you need to have a hold on who YOU are. When I say YOU I mean your brand as it is seen outwardly. Take stock of who your brand is today, at this EXACT moment online before you even develop a strategy. If you’ve decided you’re becoming a “Healthy Eating” blogger and REALLY want to work with health-based brands you’d better look the part with your online interactions. Photos of you mowing down on fast food via Instagram aren’t going to help your pitch. Perhaps you want to slant this to your advantage, how about a “Life Change to Healthy Eating” as your brand focus instead? If you indeed are making changes to your brand, get them underway before you begin pitching so that people can see and validate your voice. Google your blog name and take a look at what you find with fresh eyes. Imagine you’re seeing your brand for the first time, what do you think it’s about? This is actually a good practice for seasoned bloggers, sometimes we aren’t in touch with our outward impact simply because we’re immersed in our brand’s activities. If you have readership, you have power! Each and every person on social media/blogging has the opportunity to create a buzz with their followers and you simply must understand the power of that. Bloggers should know who their readership is and what they’re interested in, this will help you to choose which brands to pitch. My advice to bloggers who are just starting out is to look around your home and choose brands which you already use. Get yourself online and check out any campaigns they’ve done in the past and see if your blog is currently a fit for their brand personality. By getting to know the brand on social media, you’ll have some insight on what they appreciate in a campaign and can asses whether or not you have the ability to deliver the quality of work they expect. Before you pitch your brand, take the time to get it your blog looking the best it can! Make sure your design is sharp and fully functional. Clean up any broken links, update your About page, replace any photos of poor quality, ensure your avatar is consistent across your social media platforms and all are linked together and current. Make it simple for people to find you and put your best foot forward wherever you are online. Assuming you’ve chosen a brand you’d like to pitch, get online and begin interacting with them. Unless you’ve already been conversing with them directly, you’re a stranger to them. Why not write a blog post about your favourite product from the brand or chat about it on Facebook or Twitter. Brands receive copious amounts of pitches and you need to set yourself apart by showing you are an existing customer who values the products/services. This should come from a place of authenticity and be a simple interaction which genuinely reflects how you feel. Don’t waste time with a few tweets if you really have no interest, believe me it shines through! If you’re going to pitch a brand you’ll need to know who you are, what you’re capable of and what sets you apart. This is the time to think outside of the box and brainstorm something unique for the brand you’re seeking to work with. Take your time with this, have a look at what avenues there are to choose from (Vine, Instagram, Pinterest) and find an angle which suits your readers expectations while giving the most bang for the brand’s buck! Establishing yourself as a trusted blogger who works with brands takes time and energy. It’s a system which has failed when bloggers or brands aren’t clear on their abilities or expectations. Taking some time to ensure you are ready for taking on a campaign will make a world of difference, you’ll have the confidence to send your pitches to those brands you dream of working with. Stay tuned for my next post in the Blogger Pitching Brands Series where I’ll outline how to develop a solid pitch. This is really helpful!!! As a new blogger, these little tricks from those bloggers whom have tons of experience is worth so much. All of these tips are super great and anyone starting should consider doing their homework first. I am interested in couple things to see if I am heading in the right direction. Maybe you could answer by email if you prefer. 1- What rates should I charge a brand approaching me? I received pitch from companies every weeks and some would say things like: I am going to send you one product (often worth between $5 and $20). They ask for me to blog about it and talking about it on social media. Some got to the extend to ask me to put a link on my side bars. Blogging takes time and for me to put up one blog post it often takes me on average 4 hours. This include shopping for ingredients, making a recipe, taking pictures, and writing. So a $20 product will cost me money if I do buy ingredients to make one recipe with it. And if we calculate 4 hours of my time, I am blogging for free. 2- I am also interested of what companys pay per unique visitors. Do they have a rate per say if you have between 1000 to 5000 a month they will pay let’s say $50 per blog post, if you have between 5000 and 10000 that would go up to $75 etc. Let me know what you think they should pay. 3- Also what do you think of companys that says: we will send you a package (often worth between $20 and $30) and they ask for one blog post, and promoting on social media like Twitter, Facebook, Pinterest, Instagram etc. In my book this is free advertising that comes at a big price for me. Helene I’ll message you directly. Rates are a wide subject…frankly it’s very individual. This is really helpful. I currently work with brands, but I would like to get paid for the post on top of either receiving the product. How can I go about asking this? I would love any advise, sorry this is short, I am currently at work, but would love your thoughts.